Now, with a new white paper detailing how Google got to 100 percent, the lessons learned, and what’s next, the company is both finishing what it started and setting itself up for the next phase of sustainable business. And it is not alone—as Google celebrates success on its direct contracting strategy, the corporate renewable energy movement encompassed by RMI’s Business Renewables Center (BRC) is growing stronger by the day. 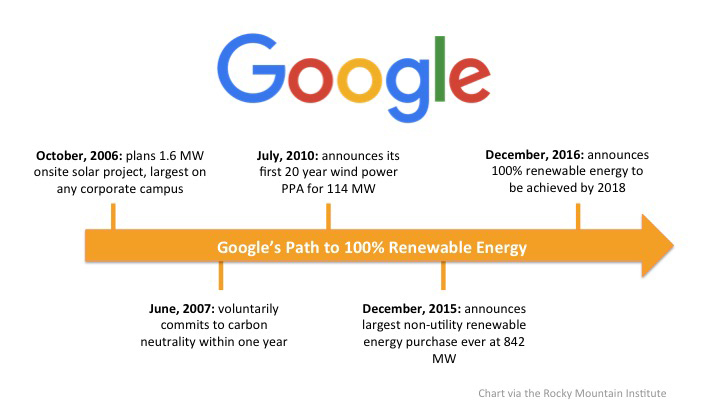 Some of Google’s earliest investments into renewable energy came during the mid-2000s and were not the off-site, long-term power purchase agreements (PPAs) we see corporates signing today. In 2006, Google planned an on-site, 1.6 MW installation at its Mountain View, California campus. At the time, the project was the largest solar installation on any corporate campus in the U.S. and offset approximately 30 percent of peak electricity consumption for the main Mountain View buildings. On-site renewable energy solutions are still popular for many business models—retail, for example, can often take advantage of significant rooftop space. But off-site procurementis an increasingly preferred model for companies seeking to buy renewables at scale, as Google soon discovered. This blog post originally appeared on the Rocky Mountain Institute Outlet, a blog that explores topics critical to RMI’s mission to drive the efficient and restorative use of resources. Copyright ©1990-2019 All rights reserved.